I’m familiar with the look of each can and jar, because my mom often sent me downstairs to fetch stuff from our dry pantry for her. (The pantry took up an entire wall with four sliding doors.) Yet, I have definitely not mastered the uses of all of them yet, at least, I’ll never feel like a master next to my mom. But this time, I actually have to toot Lon’s horn, because he’s the genius that took my Doubanjiang (Broad Bean Paste with Chili) and slathered it on Beef Short Ribs. 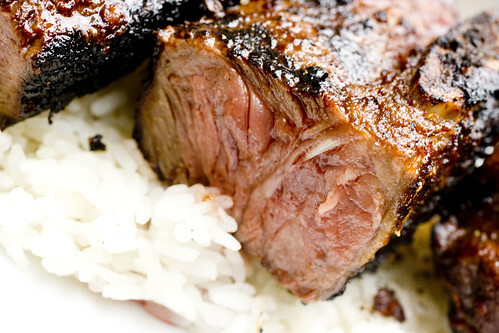 It’s ridiculously good, heightening the beefiness to a whole new level of umami overload. The sweet, salty, and spicy matches up to the grill and it becomes a powerfully flavored main course that seems like it’s Szechuan style, but you can’t put your finger on it. It’s really just heavenly and so so simple. I even thought, this is not a recipe. 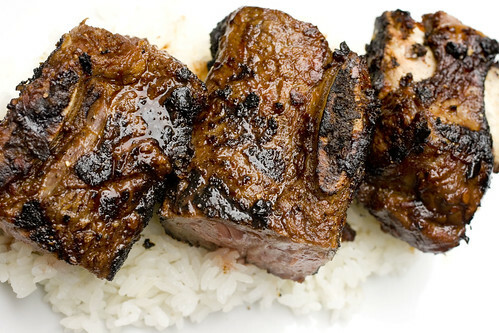 You really just slather Doubanjiang on the beef short ribs, give a generous sprinkling of freshly ground black pepper and grill to your liking. I did still write a recipe for those who are more comfortable with one. 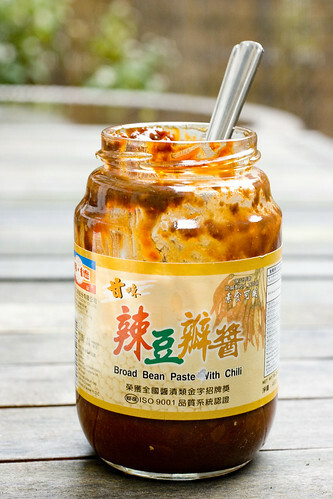 *Doubanjiang, labeled Broad Bean Paste with Chili, is available at Chinese supermarkets. 1. Preheat the grill. Set the beef on the counter to come take the chill off. 2. 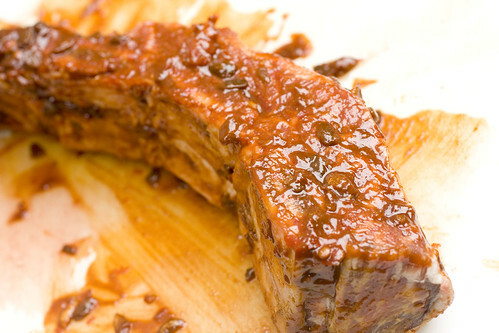 Slather doubanjiang all over short ribs, about 2 tablespoons per slab. Sprinkle with a generous amount of freshly ground black pepper. 3. Grill to your liking. (I like medium rare.) Remove from heat and let it rest for 5 minutes. 4. Cut between the bones and serve over rice. posted by jessica	at 12:52 PM	Filed under Chinese, Recipes. You can follow any responses to this entry through the RSS 2.0 feed. Both comments and pings are currently closed. YUM yum yum! I’m getting real hungry now and it’s lunchtime. Yay for Asians! My daughter LOVE soysauce to the max! SS on her rice is her favorite – thanks to my influence! This is GREAT food. Any recipe for rice with soy sauce that you can recommend with veggie trimmings and all? Thanks! There are some awesome markets in our ‘hood with these sauces for cheap! So worth it to peruse the aisles and pick them up to experiment. 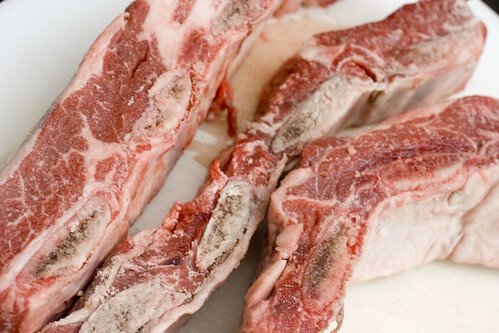 Short ribs of any kind are great. I’ve never had the Asian version, though. I’m a new reader and am really enjoying the access to these recipes, you’ve been helping me avoid the staple college food of top ramen. Turns out the I am doing a paper in my english 102 course on blogs and I was wondering if you could tell me what you think of as your taget audience, if you have one in mind. Nick, I don’t really try to target, but you can find a bunch of data on demographics for blogs (mine and others) on quantcast. EMC, is Nick one of yours? You are right: Asians are amazing with using beans! for some reason i always braise my short ribs so I always think they take forever to cook; how long does it take for medium rare? avisualperson, these thick ones take a while, about 15 minutes with something covering it. This is one of my favorite cuts of meat.